In the middle of a breakout rookie season, Donovan Mitchell has surprised everyone—including himself. The Crossover catches up with Utah's phenom in advance of his first, of what appears to be many, trips to All-Star Weekend. The Utah Jazz are on fire. After an up-and-down start to the season, often marred by injury, the Jazz have won 10 games in a row after a Monday victory over the Spurs. 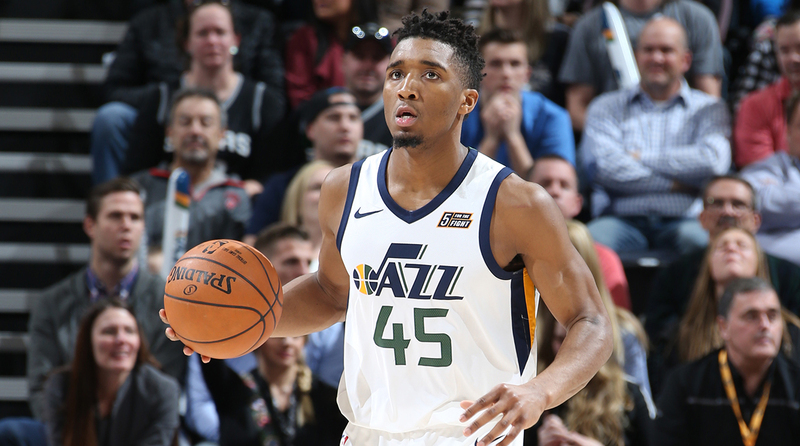 The sudden hot streak has Utah back in the hunt for a playoff spot out West, and the run has been fueled in large part by rookie Donovan Mitchell. Selected near the back of the lottery, Mitchell has surprised everyone—including himself—with all his success so far this season. The 21-year-old is averaging over 19 points per game halfway through his first year, leading the Jazz in scoring. Mitchell’s impact has him in the conversation for Rookie of the Year, and unlike some of his competitors, the Jazz guard is carrying the burden of being his team’s go-to scoring option every night. The accolades for Mitchell won’t have to wait until the end of the season, however. The rookie was selected to compete in both the Rising Stars game and the Dunk Contest on All-Star Weekend. The Rising Stars game is presented by Mountain Dew Kickstart, for whom Mitchell will also participate in community events during the All-Star break. The Crossover recently caught up with Mitchell to discuss the dunk contest, his biggest rookie moments and more. Rohan Nadkarni: What was your reaction to the Rodney Hood trade? How did you find out? Donovan Mitchell: I found out when the world found out. Having a guy like Rodney leave—I’m getting introduced to the business side of things. This whole transition to the league has been easier because of him. He helped me, he mentored me. He taught me stuff like how people guard me in the pick-and-roll. It’s tough. I understand it’s for the best. I wish him and Joe Johnson all the best. I wish them all the success in their future careers. RN: What’s it like for you to be a part of All-Star Weekend as a rookie? DM: I tweeted this when I found out—I grew up watching this. That’s the craziest part of this to me. 365 days ago I was watching All-Star in my dorm room. And now my teammates are texting me ideas on what to do in the dunk contest. It’s been a whirlwind. I’m truly blessed and truly honored. RN: How do you deal with all of this success early in your career? DM: The biggest thing with me is staying in the moment. I can say Rookie of the Year is what I want to do. I can say I want to be a part of All Star. And honestly, I did that. I had that in my head in my first five or six games. If you go back and look at my stats, I was scoreless in two games, I didn’t play well at all in the others. My mom always told me when you’re worrying about others you can’t focus on yourself. I saw I was doing that. I went back to playing my basketball. I’m focusing on the day to day and all the accolades will come. You never know when this can be gone. It’s sad to say, but with all the injuries around the league, it can be gone in a blink of an eye. RN: What’s it like being a rookie with such a large role for your team? DM: I think the biggest thing is having confidence in myself. If you know people around me, even in college, I was confident, but the possible thought of making it to the NBA was crazy. Being the shooter? I couldn’t shoot! If you told me I was going to be in the NBA a year ago, I would’ve thought, “Why are you lying to me?” But just being able to have confidence in myself. My teammates allow me to give my input—in the NBA its not normal for rookies to have this kind of freedom. My teammates have been so receptive, and without that it would be a lot harder. RN: Have you had any “Welcome to the NBA” moments so far this season? DM: I have a few; I’m going to give you three. The first one was playing against LeBron in Cleveland. That game was a “Welcome to the NBA” moment for sure. The year before I was screaming at the TV rooting for him in the Finals. Then, the 41-point game against New Orleans really changed my perspective on myself. I obviously had to have confidence going into the draft, but scoring 41 in a game gives you a different outlook as well. The last one is with my current favorite player, Russell Westbrook. He doesn’t talk to many people—I know this because I watch all the games—but he pulled me aside after the game and just told me to keep going and keep pushing. Him, PG, and Melo. Those were the craziest moments. RN: All right, I want to give you a moment to talk some trash or call out your competitors. Who are you looking forward to going against at All-Star Weekend? DM: I will give you two. For the Rising Stars, I’d like to get a shot at Ben [Simmons] and Joel [Embiid] again. I know both of them, I’m cool with Joel Embiid. But it will be fun to play against those guys. I might take this the most serious out of anyone else in the Rising Stars game. Jamal Murray may be there with me mentally, too. But I’m taking this more seriously than others. For the Dunk Contest, I’m pretty nervous. I’m more nervous for that than any other game this season. I’m worked up, but I am excited. Dennis [Smith Jr.] has a lot of stuff in his bag, so I’m excited to see what he has in store. RN: What’s your favorite dunk of all-time? DM: Actually, the guy I’m replacing, Aaron Gordon has done it. When I was in high school I would watch his highlights all the time. I learned a lot of my dunks from him. My favorite dunk from him was in high school. It was like a tomahawk double pump, not a lot of people know he’s been doing it since he was like 15. Or when he went over the mascot.